Colloidal Water - What is it and can it heal for real? Colloidal Water - What is it and can it heal for real? This month, I decided to take a dive into the world of Permaculture and pick the brains of a friend of mine, Aline Van Moerbeke who has recently launched an online course all about the topic. What is Permaculture all about? I’ve always thought Permaculture was all about gardening. Since I don’t have a very big garden, I had not given it much more thought! However, my views quickly changed after my chat with Aline. Clearly a much broader topic than I thought. Aline is part of an association called the Permaculture Women’s Guild (PWA) that has launched a new online course primarily, but not exclusively, designed for women. More than 40 women from 13 countries have collaborated to craft an accessible, comprehensive online course for a global community. Aline is excited to be a part of this Guild “training a new generation of permaculture designers with the skills they need to not only design landscapes and create closed-loop homestead systems, but also to manifest personal, cultural and ecological abundance. Aline has lived in Mallorca for 18 years. She has a background in real estate and more recently tourism, with her current ‘normal’ job as a guide for hiking and ecotourism groups. 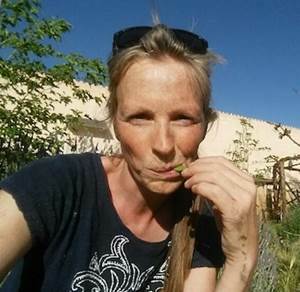 In her spare time, she has qualified as a Certified Permaculture Facilitator and is co-founder of the Mallorcan association for the spreading of Permaculture “Permacultura Mediterránea” or PermaMed (http://permamed.org). Presenting part of this 72 hour+ online course, she is particularly interested in “the Invisible structures that influence us humans”, amongst which the different leadership styles of diverse groups, financial economics and behaviour economics most capture her imagination. Following the Permaculture principle; “The Problem is the Solution”, she hopes to find clues to the sustainability riddle. Aline is also studying to be a therapist in natural medicine, nutrition and Californian Massage so she is quite a busy lady! It is becoming more obvious that there is much more to permaculture than is known to most. So if it isn’t just about gardening, what else is it about? That all sounds like quite a mouthful, but with the expanding social problems to do with the fracturing of our families and communities (albeit in Mallorca, we perhaps feel a little removed from the worst of this) – as well as the destruction on our planet, perhaps it’s time for us to learn more about how we can all influence our own families and communities on a micro level. And hope that in time it will affect the macro? The course covers a wide range of modules touching on many topics of interest to anyone, to motivate us to take on roles of becoming “co-evolutionaries and change agents of our personal lives and the world”. Quite inspiring! There is of course too much to cover in this article, but several modules particularly caught my interest including the following modules which should be important to all of us, with or without a garden! Our Environment: People often look to the garden when thinking of permaculture. However, so much of the environmental impact we make is through the design of the buildings in which we live and work. You will learn the tools necessary to see your home as a permaculture system that has ever evolving and moving parts. You will grasp a better understanding of the importance of identifying and incorporating natural sectors such as sun, wind, rain, water, or human sectors like pollution, pesticide drift and noise. Our home is the place we retreat to and the central hub of our activities. We can all in some way reduce our carbon footprint and in this module you will learn how. Water: is the most essential element to life on earth and the connector of all things. In this module, you will learn how to take care of this precious resource not only in the landscape, but also in your personal life. Strategies for managing water in the landscape and in the home to create an integrated permaculture design will be covered. The teacher of this module, Amy Stross demonstrates how she took a 400 sqm of land and turned it into a thriving micro-farm including berry bushes, fruit trees, herbs, flowers and vegetable gardens. Diet: It is recommended that we eat according to the season, naturally moving away from processed foods and sugar and start eating whole foods grown right outside your door. Learn how to make your body and our planet happy. Waste: The permaculture philosophy is “There is No Such Thing as Waste”. In this module you will explore ways to redesign the waste systems in your life so that nothing is seen or treated as waste. This topic is of particular interest to me and I will be covering waste management in Mallorca within the next 2 months. This is just a little taste of how important Permaculture is and how we all need to be more conscious of in our everyday lives. The Permaculture Design Course with Advanced Training in Social, Emotional, and Cultural Transformation course includes a standard 72-hour permaculture design curriculum that can be taken in your own time over a year, as well as plenty of hands-on activities for you to do offline, in your home and community, as a means of putting the learning into practice with 24 hour access to a faculty-student forum. You can enroll or find out more information about this course here. In 2002 Amanda arrived in Mallorca, seeking a change of pace and lifestyle after 15 years in London working in the hotel industry in international sales and marketing. She had a big wake-up call whilst nursing her dear, sweet and loving Mother through cancer. She became disillusioned with the main stream medical profession in the UK and began her own journey into alternative therapies and treatments. Since arriving on the island, her time has been spent combining a full time career in luxury real estate and pursuing her interest in personal development, alternative therapies and an holistic lifestyle. Amanda’s drive and passion is to share her experience and knowledge to enable her friends, family, and the Nourish community to help find a healthier balance in life and embrace a more holistic lifestyle. We can all take responsibility for ourselves, our lives, the society we live in, as well as the beautiful island and planet we live on.